Baby Girl Mittens These adorable newborn Baby Girl Mittens were made to go with my adorable baby girl maryjanes and preemie bonnet. These mittens are an adaptation of my crocodile crochet baby mittens. Baby Girl Mittens Pattern Notes..
Little Hands Mittens I used Bernat Sox yarn to make these mittens, they are the perfect size for toddlers aged 12 months to 3 years. Little Hands Mittens Pattern Notes..
Fingerless Gloves This was one of the first patterns I worked up. I had it saved on my external hard drive and just found it again. 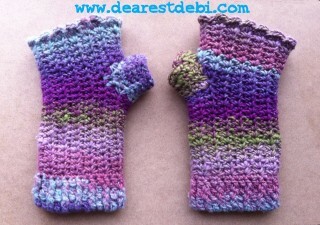 It’s a pretty simple pair of cotton fingerless gloves. Fingerless Gloves Pattern Notes..